It's getting a little ridiculous in my freezer this summer. How much ice cream do two people really need? I can't stop myself though - it's like an ice cream making disease! This time was blueberry; there were so many fresh great blueberries around that were screaming to be made into a cold creamy treat. Even thought Dave is a chocolate fan and kept asking for chocolate-I ignored him and listened to the berries. Chocolate will be around for a while, but the fresh, juicy berries needed to have their day today! So the lessons learned this time: 1. Don't add full berries to the ice cream, the skin gets chewy and makes for odd eating. Better to either strain the berry mixture or puree it before adding it in. That's really it. I wouldn't change much else- except I do think that adding lemon to the vanilla part would be really great - so I may do that next time and end up with Lemon Blueberry Swirl! Guess I'll just have to make another batch and be fat and happy! Add the cream, half and half, water, vanilla bean (scraped) and almond extract in a pot. Bring just to below a boil, turn off heat, place a cover on and let steep for about 15 minutes. Then whisk together the yolks and sugar until the yolks turn a fluffy pale yellow (this is going take about 5 or 6 minutes, just keep whisking! You're building muscle!) Now, temper the eggs by add a cup of the warm cream to the eggs, one at a time. This is bringing the eggs up the the temperature of the cream slowly to avoid scrambling the eggs. Once you've tempered the eggs, add them to the pot and turn the heat on to medium low. Stir until the the liquid starts to thicken and coats the back of a wooden spoon (if you run your finger across the back of a spoon you can see a line drawn through the custard.) Do not boil though. Place the bowl in a larger bowl of ice and water to cool. 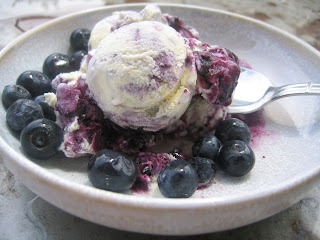 If you need to make the ice cream immediately, start on the blueberry swirl while the cream mixture is cooling, then add the cream mixture to your ice cream machine and follow the manufacturers instructions. If you can wait a day, place the custard mixture in the refrigerator for the night, make your blueberry swirl just before continuing with the ice cream machine. Waiting a day and keeping the cream mixture in the refrigerator helps the ice cream to become slightly smoother and creamier! 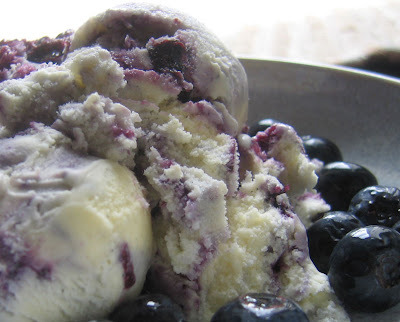 You will add the Blueberry Swirl after the cream is complete in the ice cream machine. Add all the ingredients to a pot on the stove and cook until thick. Then either mash the berries and strain (keeping just the liquid) or puree the mixture. Set aside and cool. When your ice cream is finished in the ice cream maker, fold in the blueberry liquid (or puree) just until you have a nice swirl throughout. Depending on your ice cream maker, you can add the blueberry swirl directly into the ice cream and let the machine swirl it; mine is a cheapy so I really need to swirl by hand. Serve or freeze. I added fresh blueberries to the bowl for added antioxidants!